After dinner yesterday, my stomach was worse than ever. I went in to visit Gabriel, who took me straight to the pharmacy. The pharmacist sold me something for my bowels, and it was better by the time I went to bed. I feel awkward, though, going all by myself to visit a man. I feel the eyes of every single shopkeeper on me each time I walk into his shop. I know they talk about Peter and me - we've heard them already. But Peter is unperturbed by my circumspection about being seen with a man. He's happy with his books, which are all the company he needs. He's learning Arabic and about Alexandria, which we'll be visiting next week. He trusts me, he's content. But I feel funny visiting a man. Why do I only get to meet men in this country? No wonder the men are so friendly - their women are all locked in, out of society! I've been talking to Gabriel about Mahmoud's practice of not telling you a price, but accepting what you give him. He tells me this is not normal business practice. He also finds it strange that a six-year-old girl would say "Jesus loves you" before anything else. I find it unusual, too. Maybe her parents belong to a narrow Christian cult. Lots of questions about this land. I feel completely safe with Gabriel, but his comments make me increasingly apprehensive about people like Mahmoud. Oh, well, our day is planned and it will probably be wonderful - if I can manage to feel better. It's our last day in Aswan. Tomorrow we fly to Cairo, where Mohammed will meet us at the airport. 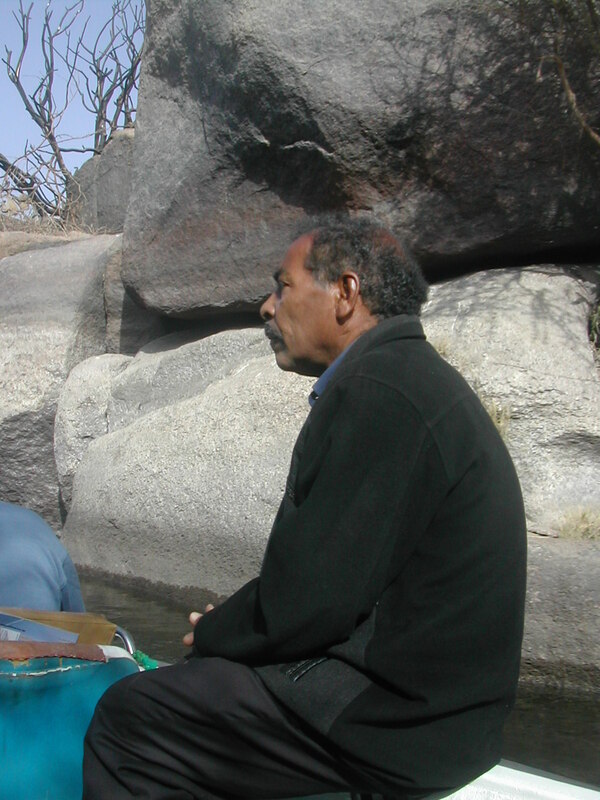 We've made a date to go bird-watching with the "Bird man of Aswan", Mr. Arabi, whom we found listed in our guidebook. It's reassuring to find someone whose name is in a book, who charges a set fee. It is also comforting to know that Mahmoud has recommended him and arranged for our first phone call with him. "He's a relative," Mahmoud told us. So - if Mr. Arabi finds Mahmoud respectable, we probably have nothing to worry about. I later find out that everyone in the Nubian village is related to everyone else, so I'm not sure just how reassuring that is. My stomach is unsettled, but the medicine is doing its job, after an initial thorough internal cleansing of my entire bowels in the early morning. Mohammed Arabi proves to be a true expert about every kind of bird. He not only knows all the birds, he knows all the trees and plants on Kitchener Island - his father was a gardener there. Mr. Arabi knows the name of every single plant and tree on that island. And all the trees and flowers all around us. We see at least thirty kinds of birds, learn about plants, and have a really nice boat ride. We now know the name of the goose we saw on ancient Egyptian frescoes in the Egyptian Museum during our last visit. It's the Egyptian goose - connected to the same bird that lived in Egypt 4,000 years ago! It's amazing, the things that connect us to the earliest recorded past. We learn that the pretty little white birds that look like ibises are in reality egrets. These egrets are a different species from the cattle egrets we've seen hopping around the fields along the Nile. The difference is in the color of their beaks. And the green leafy things we've seen on the backs of donkeys or motor scooters? That's clover - lucerne - feed for the farm animals. He is a walking dictionary. We see black ibises - traces of the ancient bird featured in the hieroglyphs. And in reedy backwaters, kingfishers. Gulls, terns, spoonbills, the great grey herons, which thrill us each time. I get all excited when Mr. Arabi shows us "wattle" trees - the very species my sister in Australia introduced to me. It is a form of acacia, and Australia's national tree. Another connection. I learn by connections to people. We spend several hours with Mr. Arabi, who also drives us around in his car to show us hawks, other birds of prey, and other trees. He is concerned about my diarrhia and asks me what I'm taking. "I've got something much better," he says. "My brother-in-law is a doctor, and he knows about something much better for you. I'll get it for you at the pharmacy." How solicitous these men are to me! The last trip to Egypt it was nausea, when men were so helpful. The men at the market might try and cheat you, but I've met others who are the kindest imaginable. Mr. Arabi is one of those rare people you meet that you could call great, and that's within one hour after meeting him. He speaks at least six languages, and his English is excellent. But it's more than that. He carries a sense of authority as he speaks. He knows. He knows about life, and he knows what makes a person of good character. We ask him how he, an Egyptologist who used to be a tour guide, became this big bird expert. "It was the English tourists," he says. "You know how the English are. You get talking about a temple, and suddenly you've lost their attention. It's all on that bird they see flying by. I decided to focus on birds, that there could be a market here." We ask him if he's having a hard time getting business in this time, with so few tourists coming to Egypt. "I'm doing fine," he says. "I'll tell you - anybody can make it if they think about it. They should find something to do that they're good at, that no one else does, and then become experts at that. They will find a market." He tells us that his father, a lowly gardener, stressed the value of education, so every one of his children received a higher education, as have Mr. Arabi's children. He and all his siblings grew up in this Nubian village, but have transcended it. Now they are all village elders. All have good careers, both inside and outside of Egypt. One of his sisters is married to a Swiss doctor, and they live in Switzerland half the year. "Another thing," he says. "You have to be truthful with people. Only then will people trust you." We can underline that sentence. These con men who try and sell us things seem to look at truth like a commodity they can bargain with. In the west, they'd probably be stockbrokers or bankers - or street hawkers. He shows us his villa. It's large and attractive, on the outskirts of the village. 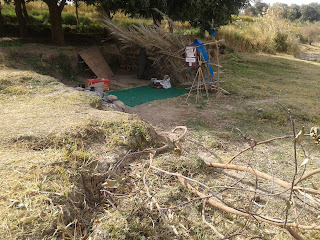 He tells me his family also has a farm outside the village, with all sorts of animals and plants. Now he's in a hurry. He wants to get to the mosque in time for Friday prayers. I wonder why it's so important to be on time for prayers. I've seen people wandering in and out of the mosques. Maybe he's a particularly devout Muslim. He still has time, though, to stop at the pharmacy and get me the medicine he says will cure everything. "Take two of these," he says, "and you'll be able to eat anything Mahmoud offers you." We are just in time to meet Mahmoud, and he is just in time to go to the mosque. We can already hear the muezzin. Mahmoud and his crew, pretty much the same group as last time, greet us. But the falouka they have for us is huge! The mast for the sail is 23 meters high. What's at least as noticeable is what's spread across the boat - a Mickey Mouse sort of pattern decorating a giant mattress spread high across the deck. We are to take off our shoes and sit or lie on it. There are also pillows for us to recline on. I wonder if the Mickey Mouse figure is the one I've heard about that they're supposed to use to indoctrinate Palestinian children in Israel to hate Jews and call for their death. "How your trip with Mr. Arabi?" Mahmoud asks. "He's a very great man," he tells us. "He always giving money to people in need in my village. He support over 200 people!" We're more impressed than ever. "How's your mother?" I ask. "Not good. She cry all night. She very afraid. But what can you do? Life is so." I don't like his fatalistic attitude. This is not my way. I wish he wouldn't give up so easily. But, now I've got an excuse to not pursue the idea of prayer any more. They all expect her to die anyway. I guess it's all for the best this way. The day is perfect. We ride with them for about five hours, watching the birds we have just learned about. We eat delicious fried fish Mahmoud's sister has prepared for us. It's Nile fish, perch, rubbed with cumin. Another kind of fish is stuffed with garlic, something hot, and something green. One of the crew has cooked rice with onions. We eat a cucumber-tomato salad with coriander, tahina and pita bread. There's plenty of bottled water, and also karkaday - that delicious hibiscus tea. We drink all the tea, and are offered more. 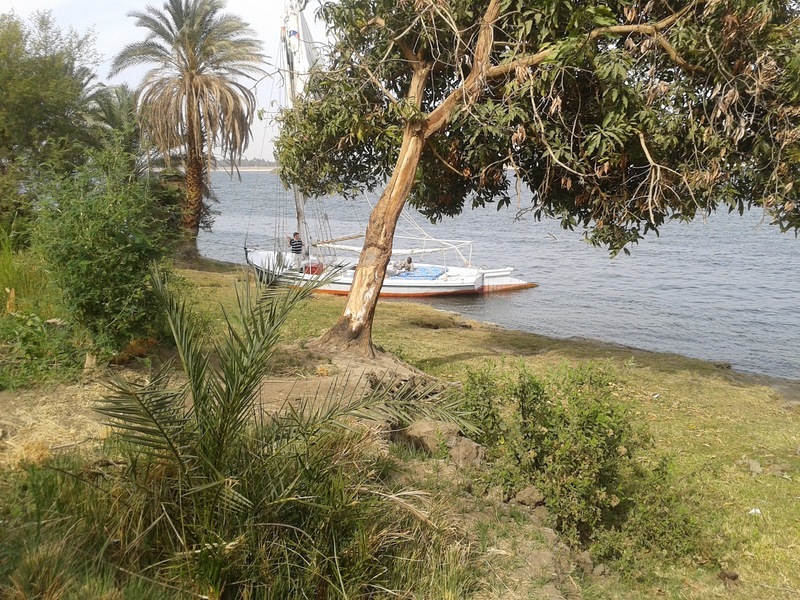 I am horrified when I see that the man simply dips into the Nile to get more water for tea. Can my stomach take this? But so far the medicine is working fine. The sun shines brilliantly and warm. We sit and soak in the sun, while Mahmoud seems to be spending hours on his cell phone. We pass the same newly built mosque we passed on our falouka ride in October. A voice is broadcast, loud, reaching across the waters. We see a long line of cars parked along the road. "What is the man talking about? We keep hearing the name Mubarek," we ask Mahmoud, once he is off the phone. "Tomorrow the anniversary of Mubarek not being in power any more." "February 11 is the anniversary date?" "Yes. They expect violence. All over Egypt, but especially in Cairo." Mahmoud says people want to have Mubarek killed tomorrow, and that Mubarek's people are threatening to set fire to major buildings if Mubarek gets killed. He says a tower in Alexandria was set on fire last week. Oh, no! And we're going to Cairo, just in time to get killed by a crazy mob! "He's telling the people to stay home and pray. To pray for peace." "Let's all pray," I say. Peter and I pray silently, while Mahmoud and his crew get up and do their ritual prayers. After a couple of hours we put in on land. "This Nubian land," Mahmoud says. "It's OK for you to go and wander around." By now I really need to pee. 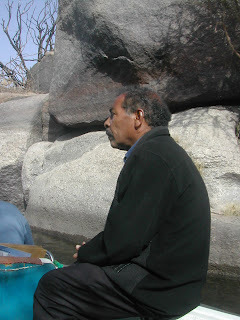 I climb out of the boat and walk a few meters, and then come upon a very black and very wild, viscious looking man who speaks to me in Arabic - or Nubian, or something. He has a saber in his hand. He does look menacing. He is apparently the shepherd for the animals on this bit of land. I have taken a picture of his resting area. Then he says in clear English, "Go away." I leave as quickly as possible, heading straight for the boat. How am I ever going to go to the bathroom? There are no facilities like that here, and we whites are not wanted on this land. The men are idle, relaxing, eating the food they recently served us. I'm back on the boat, wondering if I'm going to pee in my pants. I go ashore again. Blast! Another man! What if I get accosted, or raped or something here? What if someone sees me! Or tells me to leave, just when I've got my pants down? Someone on the crew points to a place where I can go. I walk over there, looking around to see if anyone can see me. I try and release my bladder. Nothing will come. I pull my capris back up and head back to the boat. But I really must. I've got a lot of tea and water to get rid of. I go back to the bush. Finally, after agonizing minutes when nothing comes, I relax enough to go. 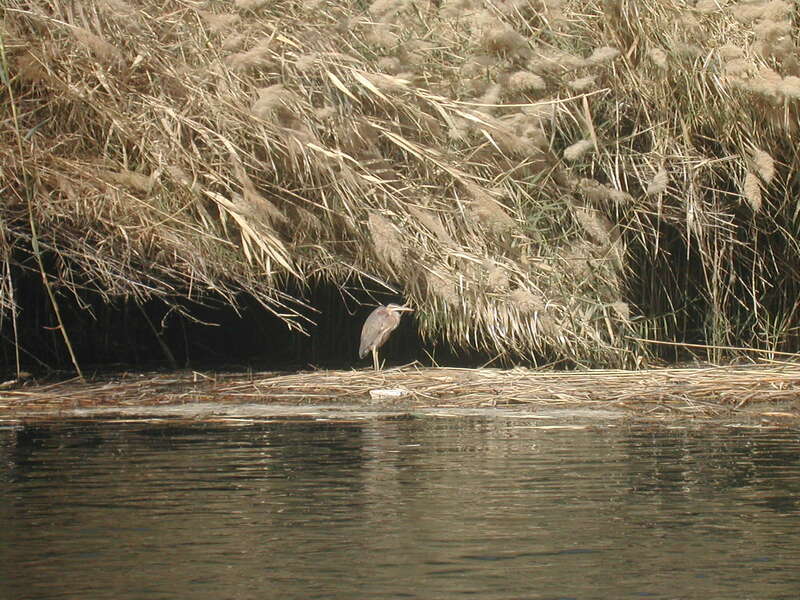 This seems symbolic of our time here in Aswan, on our own. Just as we still feel with Mahmoud, you never quite know what you're getting in for here, organizing things on your own. We leave the shore, slowly heading back for Aswan. The current is so strong, we don't even need a sail to take us back. "Next time we go on falouka for several days," says Mahmoud. 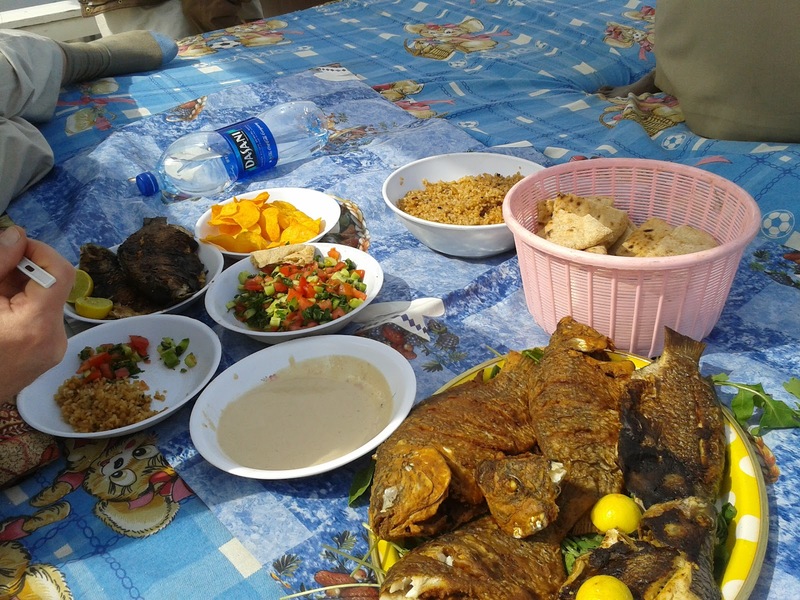 "We can sleep here, eat here, and sail all the way to Edfu. Much nicer than your hotel." "Not on your life," whispers Peter to me. "I'll take our hotel and pushy salespeople any day." What to give Mahmoud? Mr. Arabi wanted LE650 for our bird tour, so we decide to give Mahmoud and co. at least the same amount. They seem surprised and delighted with their pay. Then Mahmoud says to me, "Oh, my poor mother needs blood from us for her operation - she will be operated on this week, and we have to pay LE4,000 for the blood." I feel guilty about not having offered to go and pray for her. But I let it go. Maybe he's just making the whole thing up. Or maybe he's trying to get more money out of us than he should. I remember what Gabriel said. "Just pray. No money!" Back at the hotel, we check our email. A friend of mine has replied to an email I sent her. She's ecstatic about the idea of my praying for Mahmoud's mother. I feel like creeping into a corner somewhere and curling into a ball. Such cowardice! I had already agreed with Peter - I would offer the prayer to Mahmoud, and see what his response is. Instead, I've done nothing, afraid of his intentions. Well, there's still time. After dinner I go to the reception area, asking how to make an outside call. There's a phone in our room, but it seems you can only call reception from that phone. I have to go into the "telephone room", as they call it, where an attendant will dial the number for me. How embarrassing. But I do it. I tell the attendant who I want to call. Fodder for more gossip. He hears every word I say. "That is good, " Mahmoud says. "But I want to pray in Isa's (Jesus') name," I say, hoping he will say no. "No problem. That is good. How we do this?" He is taking us to the airport anyway, so we agree to meet an hour earlier, and go from his home to the airport. Then we visit Gabriel one last time. "You're leaving already?" he says sadly. "I will miss you." "I don't have a computer," he reminds me. I forgot. This man, rich in Christ, is too poor for a computer. Later that night Mahmoud calls our room. He says he's so worried about us in Cairo. So are we. We've checked the news, just to make sure he hasn't been telling us a story. There is reason to be worried. Demonstrations are planned on the one-year anniversary of Mubarek's downfall from power. Now he tells us some Germans were kidnapped from Sharm-El-Sheikh, and some other German working on Elephantine Island has already returned to Germany so as not to be in danger. Is this story true? Or does Mahmoud want us to stay longer so he can get more money from us? Or is he really worried? How much of what he says is true? We do know from the press that strikes are planned for tomorrow, and there will be demonstrations. Even the hotel manager has said we should stay away from Tahrir Square. We will see. The good thing is, as Gabriel assured me, we have God, who is watching over us. It's been a wonderful day, albeit a bit tense, rather full of mystery and suspense. Providing we don't get killed, Cairo should be a much more secure place, under Mohammed's wing for the better part of a week.